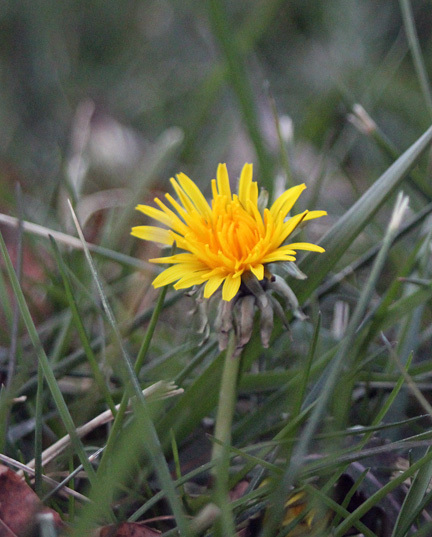 Winter Dandelions – Hardy Plants or Dumb Plants? It was 17 F last night. Presently about 25 F. Yet about a dozen dandelions are in bloom in my yard. Absolutely no hope of insect pollination. Do these plants have a plan or will nature remove them from the gene pool? I don’t know, but I have them here in Shelby County, too …. of course, my girls are still flying for at least a few hours a day, temps and precip permitting, so maybe something’s going on ….. I suppose the most obvious answer is that these plants are not yet well adapted to cold climates, but after having been here for for so many years, I would have thought that nature would have removed both the early and late bloomers. I still don’t have a “one size fits all” answer. Dandelions can reproduce vegetatively as well as by seed, so perhaps enough of the root from prior growth survived long enough to develop (albeit a tad late) in the warmer winter-weather we’ve had? Maybe we can dind a “dandelion whisperer” to communicate with them and find out what’s really going on! i’m still seeing pollen coming in. mostly dandelion and henbit. Some plants reproduce by selecting the strains that are the best adapted to a region. I think this is what you are expecting. Don’t forget that natural selection works to the other extreme also. Since dandelions bloom every month of the year, they are always prepared to take advantage of any opportunity at pollination. Instead of trying to be ready when the weather is more cooperative, dandelions stay ready all the time to take advantage of any available opportunity. After all, there usually is at least one day in every month that weather conditions are favorable if the dandelion is ready. Humans haven’t adapted either. Survival for babies born in winter is more difficult than for babies born in the warm summertime, yet humans are ready for every opportunity to reproduce, every month of the year.